Optimize, design, and manage the operational and manufacturing processes by which goods are made and distributed. The industrial engineering degree is for students interested in optimizing, designing, and managing the processes by which goods are made and distributed. They also ensure that high-quality products and services are delivered in a cost-effective manner. Industrial engineers aid companies globally, balancing sustainable design with skillful construction of systems. Graduates of the industrial engineering degree are able to address big-picture design and engineering questions, such as how engineers can simultaneously increase efficiency and quality? Industrial engineers design, optimize, and manage the process by which products are made and distributed across the world (i.e., global supply chain), or the way services are delivered in industries such as banking, health care, energy, or entertainment. Industrial engineers ensure that high-quality products and services are delivered in a cost-effective manner. Industrial engineering is ideal for those who enjoy both technology and working with people. Industrial engineers frequently spend as much time interacting with other engineers and product users as they do at their desks and computers. Typical work involves developing applied models and simulations of processes to evaluate overall system efficiency. A degree in industrial engineering offers students a significant opportunity for a flexible long-term career. Employers have consistently praised the quality of RIT's industrial engineering graduates, noting that the range of their abilities includes both strong technical knowledge and communication skills. Graduates have used their technical base as a springboard to careers in management, consulting, manufacturing, sales, health care, law, and education. 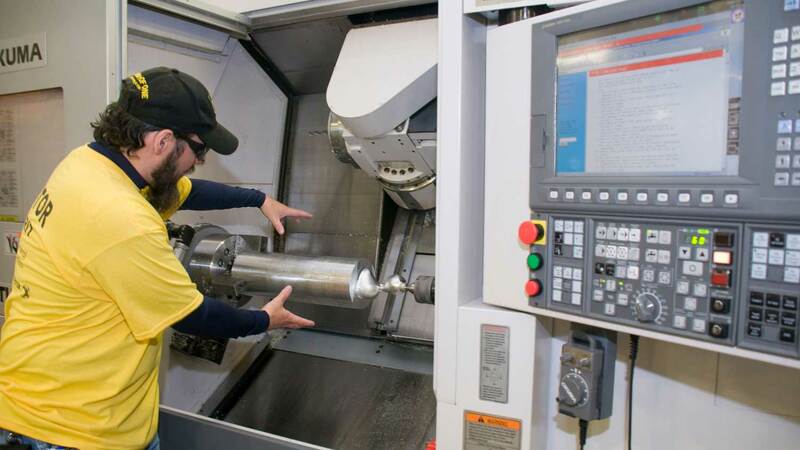 Because of the flexible nature of the major, the industrial engineering student can gain a breadth of knowledge in many different areas of industrial engineering, including, but not limited to, advanced manufacturing, distribution/logistics, ergonomics/human factors, modeling/simulation, and sustainable design and development. Students may choose free and professional electives for this purpose. Faculty are committed to high-quality engineering education as well as the program's educational objectives. The industrial engineering curriculum covers the principal concepts of engineering economics and project management, facilities planning, human performance, mathematical and simulation modeling, production control, applied statistics and quality, and contemporary manufacturing production processes that are applied to solve the challenges presented by the global environment and economy of today. The curriculum stresses the application of contemporary tools and techniques in solving engineering problems. "Industrial engineering is about choices. Other engineering disciplines apply skills to very specific areas. IE gives practitioners the opportunity to work in a variety of businesses. Many practitioners say that industrial engineering education offers the best of both worlds: an education in both engineering and business. The most distinctive aspect of industrial engineering is the flexibility it offers. Whether it's shortening a roller coaster line, streamlining an operating room, distributing products worldwide, or manufacturing superior automobiles, these challenges share the common goal of saving companies money and increasing efficiencies. Industrial engineers figure out how to do things better. They engineer processes and systems that improve quality and productivity. They work to eliminate waste of time, money, materials, energy and other commodities. This is why many industrial engineers end up being promoted into management positions. Many people are misled by the term industrial engineer. It's not just about manufacturing. It also encompasses service industries, with many IEs employed in entertainment industries, shipping and logistics businesses, and health care organizations." Industrial engineers are "big-picture" thinkers, much like systems integrators. IEs spend most of their time out in the work environment, using scientific approaches to solve today's problems while they develop solutions for the future. Systems integrators—Graduates will draw upon broad knowledge to develop integrated systems-based engineering solutions that include the consideration of realistic constraints within contemporary global, societal, and organizational contexts. Lifelong learners—Graduates will develop engineering solutions using the skills and knowledge acquired through formal education and training, independent inquiry, and professional development. Graduate education—Graduates will be well-prepared to pursue graduate degrees. Engineering professionals—Graduates will work independently as well as collaboratively with others and demonstrate leadership, accountability, initiative, and ethical and social responsibility. With rapidly changing work environments, students need a well-rounded education that will allow them to apply engineering principles to new situations. The BS program in industrial engineering is accredited by the Engineering Accreditation Commission of ABET, http://www.abet.org. Visit the college's accreditation page for information on enrollment and graduation data, program educational objectives, and student outcomes. An accelerated 4+1 option is available for students who wish to earn a BS in industrial engineering and an MBA. The option is offered in conjunction with Saunders College of Business and allows students to obtain both degrees in five years of study. A number of accelerated dual degree options are available that enable students to combine a BS in industrial engineering with a variety of master's degrees, allowing students to earn both degrees in approximately five years of study. The Times Union features RIT students Patrick Finnerty and Catherine Krawiec, part of a team that won second place in the CREATE Symposium. Saunders Summer Startup Program encourages multidisciplinary student teams to jumpstart their ventures in hopes of kick starting real companies. It culminates with Investor Demo Night on Wednesday. This course introduces students to industrial engineering and provides students with foundational tools used in the profession. The course is intended to prepare students for their first co-op experience in industrial engineering by exposing them to tools and concepts that are often encountered during early co-op assignments. The course covers specific tools and their applications, including systems design and the integration. The course uses a combination of lecture and laboratory activities. Projects and group exercises will be used to cover hands-on applications and problem-solving related to topics covered in lectures. A study of the application of machine tools and fabrication processes to engineering materials in the manufacture of products. Processes covered include cutting, molding, casting, forming, powder metallurgy, solid modeling, engineering drawing, and welding. Students make a project in the lab portion of the course. A first course in computational problem solving for engineers. Students will learn the theory necessary to develop algorithms to solve computational problems in the engineering disciplines. Topics include: program design and implementation, integrated development environment, mathematical operations, file input/output, data manipulations, functions, and arrays. Course also covers an introduction to implementing object-oriented programming and graphical user interface. This course covers statistics for use in engineering as well as the primary concepts of experimental design. The first portion of the course will cover: Point estimation; hypothesis testing and confidence intervals; one- and two-sample inference. The remainder of the class will be spent on concepts of design and analysis of experiments. Lectures and assignments will incorporate real-world science and engineering examples, including studies found in the literature. Statics: equilibrium, the principle of transmissibility of forces, couples, centroids, trusses and friction. Introduction to strength of materials: axial stresses and strains, statically indeterminate problems, torsion and bending. Dynamics: dynamics of particles and rigid bodies with an introduction to kinematics and kinetics of particles and rigid bodies, work, energy, impulse momentum and mechanical vibrations. Emphasis is on problem solving. For students majoring in industrial and systems engineering. This is an introductory course in linear algebra and ordinary differential equations in which a scientific computing package is used to clarify mathematical concepts, visualize problems, and work with large systems. The course covers matrix algebra, the basic notions and techniques of ordinary differential equations with constant coefficients, and the physical situation in which they arise. Time value of money, methods of comparing alternatives, depreciation and depletion, income tax consideration and capital budgeting. Cannot be used as a professional elective for ISE majors. Course provides a foundation for engineers to effectively analyze engineering projects with respect to financial considerations. One semester of paid work experience in industrial engineering. An introduction to optimization through mathematical programming and stochastic modeling techniques. Course topics include linear programming, transportation and assignment algorithms, Markov Chain queuing and their application on problems in manufacturing, health care, financial systems, supply chain, and other engineering disciplines. Special attention is placed on sensitivity analysis and the need of optimization in decision-making. The course is delivered through lectures and a weekly laboratory where students learn to use state-of-the-art software packages for modeling large discrete optimization problems. Development of the fundamental engineering management principles of industrial enterprise, including an introduction to project management. Emphasis is on project management and the development of the project management plan. This course covers the physical and cognitive aspects of human performance to enable students to design work places, procedures, products and processes that are consistent with human capabilities and limitations. Principles of physical work and human anthropometry are studied to enable the student to systematically design work places, processes, and systems that are consistent with human capabilities and limitations. In addition, the human information processing capabilities are studied, which includes the human sensory, memory, attention and cognitive processes; display and control design principles; as well as human computer interface design. A basic course in quantitative models on layout, material handling, and warehousing. Topics include product/process analysis, flow of materials, material handling systems, warehousing and layout design. A computer-aided layout design package is used. This course provides the student with an overview of structure, properties, and processing of metals, polymers, and ceramics. There is a particular emphasis on steels, but significant attention is given to non-ferrous metals, ceramics, and polymers. A required laboratory course taken concurrently with MECE-304 Fundamentals of Materials Science or MECE-305 Materials Science with Applications. Students investigate the effects of the structure, alloying, and processing of materials on their mechanical properties. Students are also introduced to standardized testing methods and effective, professional, report writing. A first course in mathematical modeling of production-inventory systems. Topics included: Inventory; Deterministic Models, Inventory: Stochastic Models, Push v. Pull Production Control Systems, Factory Physics, and Operations Scheduling. Modern aspects such as lean manufacturing are included in the context of the course. An applied approach to statistical quality control utilizing theoretical tools acquired in other math and statistics courses. Heavy emphasis on understanding and applying statistical analysis methods in real-world quality control situations in engineering. Topics include process capability analysis, acceptance sampling, hypothesis testing and control charts. Contemporary topics such as six-sigma are included within the context of the course. Computer-based simulation of dynamic and stochastic systems. Simulation modeling and analysis methods are the focus of this course. A high-level simualtion language such as Simio, ARENA, etc., will be used to model systems and examine system performance. Model validation, design of simulation experiments, and random number generation will be introduced. In any system where parameters of interest change, it may be of interest to examine the effects that some variables exert (or appear to exert) on others. "Regression analysis" actually describes a variety of data analysis techniques that can be used to describe the interrelationships among such variables. In this course we will examine in detail the use of one popular analytic technique: least squares linear regression. Cases illustrating the use of regression techniques in engineering applications will be developed and analyzed throughout the course. This is a two course sequence oriented to the solution of real world engineering design problems. This is a capstone learning experience that integrates engineering theory, principles, and processes within a collaborative environment. Multidisciplinary student teams follow an engineering design process, which includes assessing customer needs, developing engineering specifications, generating and evaluating concepts, choosing an approach, completing systems and subsystems designs, and implementing the design to the extent feasible, for example by building and testing a prototype or implementing a chosen set of improvements to a process. This course will prepare students, who are entering their second year of study, for both the job search and employment in the field of engineering. Students will learn strategies for conducting a successful job search, including the preparation of resumes and cover letters; behavioral interviewing techniques and effective use of social media in the application process. Professional and ethical responsibilities during the job search and for co-op and subsequent professional experiences will be discussed. This course presents an in-depth study of the primary concepts of experimental design. Its applied approach uses theoretical tools acquired in other mathematics and statistics courses. Emphasis is placed on the role of replication and randomization in experimentation. Numerous designs and design strategies are reviewed and implications on data analysis are discussed. Topics include: consideration of type 1 and type 2 errors in experimentation, sample size determination, completely randomized designs, randomized complete block designs, blocking and confounding in experiments, Latin square and Graeco Latin square designs, general factorial designs, the 2k factorial design system, the 3k factorial design system, fractional factorial designs, Taguchi experimentation. For the Master of Engineering programs in Industrial and Systems Engineering, Engineering Management, and Sustainable Engineering. Students must investigate a discipline-related topic in a field related to industrial and systems engineering, engineering management, or sustainable engineering. The general intent of the engineering capstone is to demonstrate the students' knowledge of the integrative aspects of a particular area. The capstone should draw upon skills and knowledge acquired in the program. Statistics in engineering; enumerative and analytic studies; descriptive statistics and statistical control; sample spaces and events; axioms of probability; counting techniques; conditional probability and independence; distributions of discrete and continuous random variables; joint distributions; central limit theorem. Systems and Project Management ensures progress toward objectives, proper deployment and conservation of human and financial resources, and achievement of cost and schedule targets. The focus of the course is on the utilization of a diverse set of project management methods and tools. Topics include strategic project management, project and organization learning, cost, schedule planning and control, structuring of performance measures and metrics, technical teams and project management, information technology support of teams, risk management, and process control. Course delivery consists of lectures, speakers, case studies, and experience sharing, and reinforces collaborative project-based learning and continuous improvement. A first course in accounting for students in technical disciplines. Topics include the distinction between external and internal accounting, cost behavior, product costing, profitability analysis, performance evaluation, capital budgeting, and transfer pricing. Emphasis is on issues encountered in technology intensive manufacturing organizations. *Note: This course is not intended for Saunders College of Business students. The BS/MS in industrial engineering and applied statistics is no longer accepting new students. Currently matriculated students are not affected. This course will provide an introduction to concepts and techniques in the design and analysis of production systems. A blend of traditional and modern approaches is brought into the classroom. 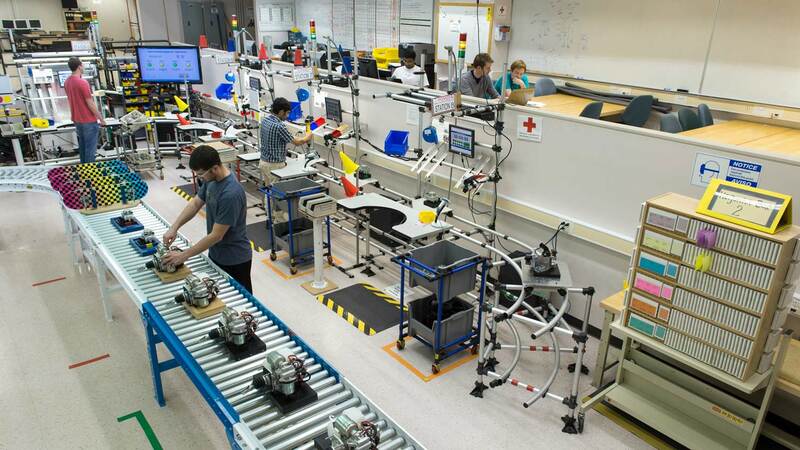 At the end of the semester, the student will be able to assess and analyze the performance of a given manufacturing system as well as to provide a framework for system redesign and improvement. Modern aspects such as lean manufacturing are included in the context of the course. This course provides graduate students with necessary tools to help them become effective policy analysts. The course places particular emphasis on understanding the policy process, the different approaches to policy analysis, and the application of quantitative and qualitative methods for evaluating public policies. Students will apply these tools to contemporary public policy decision making at the local, state, federal, and international levels. This course provides students with an introduction to decision science and analysis. The course focuses on several important tools for making good decisions, including decision trees, including forecasting, risk analysis, and multi-attribute decision making. Students will apply these tools to contemporary public policy decision making at the local, state, federal, and international levels. An in-depth inquiry into key contemporary public policy issues. Students will be exposed to a wide range of important public policy texts, and will learn how to write a literature review in a policy area of their choosing. The focus of this course is on evaluation of program outcomes and research design. Students will explore the questions and methodologies associated with meeting programmatic outcomes, secondary or unanticipated effects, and an analysis of alternative means for achieving program outcomes. Critique of evaluation research methodologies will also be considered. Examines how federal and international policies are developed to influence research and development, innovation, and the transfer of technology in the United States and other selected nations. Students in the course will apply basic policy skills, concepts, and methods to contemporary science and technology policy topics. Pre-engineering courses such as calculus, calculus-based physics, chemistry, and liberal arts. The industrial and systems engineering department is located in the James E. Gleason Building and houses several state-of-the-art laboratories, including the Brinkman Machine Tools and Manufacturing Lab, the Metrology and Rapid Prototyping Lab, the Toyota Production Systems Lab, the Occupational Ergonomics and Biomechanics Lab, the Advanced Systems Integration Lab, the Sustainable Engineering Research Group (SERG) Lab, and the Print Research and Image Systems Modeling (PRISM) Lab. Ample computing facilities reside within each of these specialized labs, as well as a dedicated PC computer lab. These labs offer an extensive library of software to support industrial engineering course work, project work, and research, including conventional word processing, spreadsheet, and presentation applications (e.g., Microsoft Office), database management (e.g., Microsoft ACCESS), data acquisition (e.g., Lab View), statistical analysis (e.g., Minitab, SAS), facilities layout (e.g., AutoCad, Factory Flow, Factory Plan, LayoutIQ), manufacturing (e.g., MasterCam Cambridge Engineering Selector Software), optimization (e.g., ILOG OPL-CPLEX, LINDO, KNITRO, AMPL, Gurobi, Mathematica), systems simulation software (e.g., Solver, Arena, Promodel), biomechanics (3DSSPP), and lifecycle assessment and costing tools (e.g., SimaPro, CES Eco-Audit). Balance, as well as specialization, has allowed our graduates to pursue varied paths. Examples of the diversity, along with the roles in which an industrial engineer might function, are reflected in the following list of sample industrial engineering co-op assignments.